At present, the Tally Whyte series consists of four books in the following order—Body Parts, The Dead Stone, The Grief Shop, and The Bone Man. When a homicide counselor discovers her friend’s body brutally murdered, she must find the killer before they seek further vengeance on those she loves. When Tally learns the grim tale of a young woman’s murder is horribly real, she must fight both strangers and a lover to find the ritualistic killing's source before the knife plunges again. They call it the Grief Shop. It's the Office of the Chief Medical Examiner for Massachusetts, and Tally Whyte is the director of its Grief Assistance Program. She lives with death every day, counseling families of homicide victims. But now death is striking close to home—Tally finds an old friend murdered, and the circumstances are disturbingly strange. Even more disturbing, the next death Tally must confront may be her own. 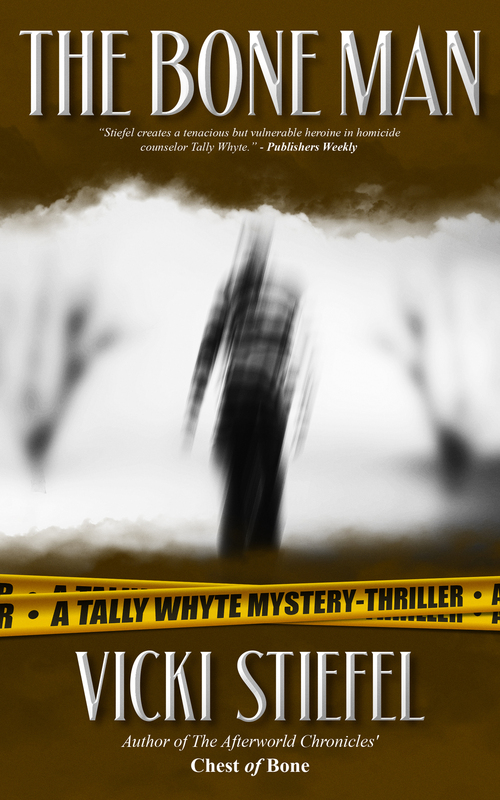 Boston is being terrorized by a killer known as the Harvester, and many of the victims are people that Tally knows. There's a connection, Tally realizes, a link that only she can find. And she'd better find it fast. With each kill, the Harvester is getting closer to Tally. To recharge both her physical and emotional self, homicide counselor Tally takes a sabbatical from Boston's MGAP. Accompanied by her three-legged K-9 companion, Penny, she rents a cottage in Winsworth, Maine, where she plans to do some private counseling, fly fish, and reacquaint herself with a town and friends she hasn’t seen in more than two decades. Things soon go horribly awry when a disturbing tale she hears from a stranger turns out to be grimly real: a young woman has been ritualistically murdered on the Dead Stone, a woman Tally knew as a child. Simultaneously, when Tally reveals who she is to a beloved teacher, the woman’s vitriolic response horrifies her until she meets a cop who stirs long-dormant romantic embers within her. When Tally realizes a murderer has dumped his victim at the morgue, she must uncover the meaning behind “Sins of the Father” before more children meet the same fate. Homicide counselor Tally Whyte has seen a lot of dead bodies in her years with the Massachusetts Grief Assistance Program, but this is the first time a murder victim has been brought to the morgue by the murderer himself. "I’ve seen a lot of bodies in my years as a counselor to the families of homicide victims. But this is a first—a homicide victim delivered to the Medical Examiner’s Office, aka The Grief Shop, by the murderer himself. His tragic calling card—a murdered young girl with “Sins of the Father” scrawled on her hand. The girl’s playmate is also missing. Will she be a victim, too? Or can I save her and the others imprisoned in a web of deadly secrets woven by a killer’s warped sense of justice? I dread the thought of history repeating itself. I feel the heart of darkness closing in, but I will desperately try to save others from its withering touch. When Tally sees a forensic reconstruction of a murder victim, she must unravel how a centuries-old pot held a modern woman’s skull and unearth an ancient prize worth killing for. It was a fascinating anthropological discovery—a human skull found inside a clay Anasazi pot more than eight hundred years old. But as soon as Boston homicide counselor Tally Whyte sees the forensic facial reconstruction, she goes from fascinated to horrified. The face belongs to an art dealer friend, a woman Tally knows well. How could a contemporary skull find its way into a centuries-old clay pot? And more importantly, how did the woman die? Tally's search for answers will lead her from Boston to Martha's Vineyard to New Mexico, where she will learn of the Blood Fetish, a priceless artifact as old as the Anasazi themselves—with secrets worth killing for.